How fun are jelly cupboards? The Amish Colonial Jelly Cupboard offers the enduring appeal of the jelly cupboard along with a versatile storage element for your home. Wood is sculpted with early american style adornments. Raised panels on the doors add to the charm. This jelly cupboard features one drawer and one cabinet. A perfect fit for that spot where you need a little storage. Amish made by hand, this colonial style furniture is completely customizable to match your home decor. Will this storage cabinet get a lot of wear? No worries. It's Amish made to be durable and beautiful at the same time. 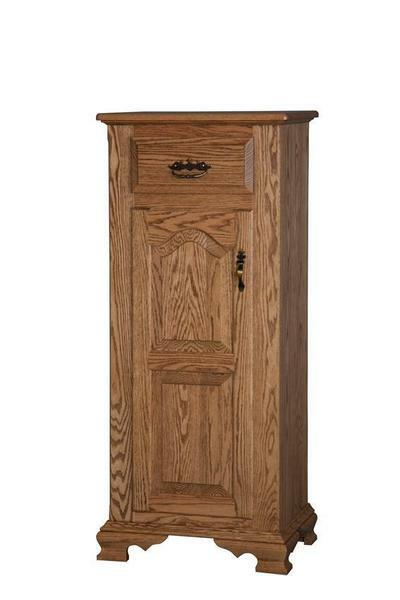 DutchCrafters is home to the largest collection of Amish furniture offered online. Browse a wide variety of beloved jelly cupboards to find your favorite. Thank you for shopping with DutchCrafters.